Book online today to save. 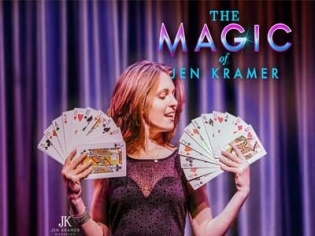 Tickets to see the Magic of Jen Kramer are deeply discounted at up to 26% off per ticket. An evening of jaw-dropping fun with the magic and mentalism of Jen Kramer, winner of the 2016 Female Magician of the Year. You may recognize Jen Kramer from her appearances on Masters of Illusion or Penn and Teller; she is an accomplished magician that can change a one dollar bill into a hundred! The show is fun for all ages and she is a master of getting the audience involved; she cracks a few jokes then performs her next mind-boggling trick. A graduate of Yale University, she brings next-gen exuberance into the world of magic. A contagious smile and a world-class sleight of hand will endear you to Jen and her unique brand of comedic magic. An up-and-coming new face to the magic scene, go and see her now!